You thought Cinco de Mayo was Independence Day for Mexico? History.com has a nice explanation, with a nice little video. “It ain’t about the Margaritas: The real meaning of Cinco de Mayo,” at NPR’s The Takeaway. Perhaps the U.S. should celebrate the day, too, at least in those states who were not in the old Confederacy. On May 5, 1862, Mexicans under the command of 33 year old Commander General Ignacio Zaragoza Seguín stopped the quick advance of superior French forces trying to invade Mexico to take it over, at the Battle of Puebla. 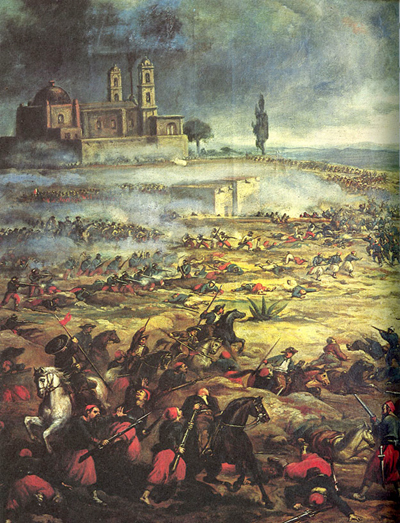 While France did eventually defeat Mexican forces (after getting 30,000 men in reinforcements), the spirit of May 5 inspired Mexicans to continue to fight for freedom. And ultimately, Mexican forces overpowered and captured the French forces and Emperor Maximilian, who was executed. Thus ended a great hope for the Confederacy, that a French-supported Mexican Army would lend aid to the Confederates in their struggle to secede from the Union. It is one of the great what-ifs of history: What if France had kept Mexico, and what if French-led Mexican forces backed up the Confederate Army, as Confederates and the French hoped? One thing is rather sure: Had that happened, and had the Confederacy been successful, we wouldn’t be celebrating Cinco de Mayo in Texas today. What do the scholars of Lincoln have to add? Mexican Independence Day is September 16. Update: A reader sends a note that Seguin was a Texan. So the Mexican hero of the Battle of Puebla was a Texan. You couldn’t make this stuff up — real history is always more interesting than fiction. Most deadly battle ever in Texas? Back in 2006, reporter Art Chapman in the Fort Worth Star-Telegram made a plea to remember the deadliest battle for Texas independence, fought years before the Texas Revolution (in an article that may be gone from the internet). In 2013 the Battle of Medina lay buried under seven more years of newspapers and historic events. We need to fight to remember history. This is another punch in that fight. Two years after the bicentennial, does anyone remember it yet? The long drive for Texas independence from Mexico may be more clearly seen in the light of the continents-long struggles for independence that included not only the American Revolution, but also revolutions in the nations of Haiti, Mexico, Chiapas, and others across Central America and South America. The Battle of Medina was a part of that earlier history. Fought on August 18, 1813, it was more deadly than any other battle in the wars for Texas independence, it is linked to Mexico’s long history of struggle. It occurred in the same year that Haiti got independence, and in the middle of the War of 1812, which helps to obscure the history of the battle. “Contrary to popular belief, the struggle for democracy in Texas did not begin with the Anglo-led revolution of 1835-36,” author and historian James Haley wrote in a recent Austin American-Statesman article. “In fact, the yearning for liberty had its own ongoing legacy in Latin America. America was drawn into that campaign when it funded a small force under the control of Bernardo Gutierrez de Lara, one of Father Hidalgo’s emissaries. 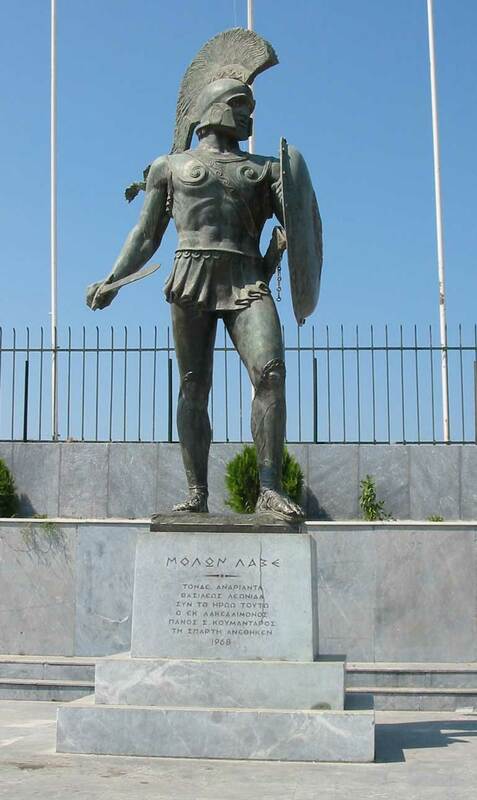 A former Army officer, Augustus Magee, went along with the expedition to offer military advice. The Gutierrez-Magee Expedition, also called the Green Flag Rebellion because of its banner, soon captured Nacogdoches. All went well for the expedition — too well — and Texas independence was quickly claimed. Spain took immediate measures to quell the insurrection. It ended at the Battle of Medina, “the biggest, bloodiest battle ever fought on Texas soil,” a South Texas historian says. Spanish forces slaughtered more than 1,000 of the rebels, perhaps as many as 1,500. The battle methods, and total extirpation of the losing forces, would recur in the Texas Revolution. 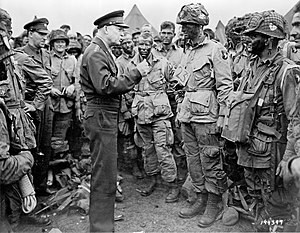 Fewer than 100 republic troops survived the battle, Thonhoff said. Those not killed in the battle were later chased down and executed. Retaliation went on for days. 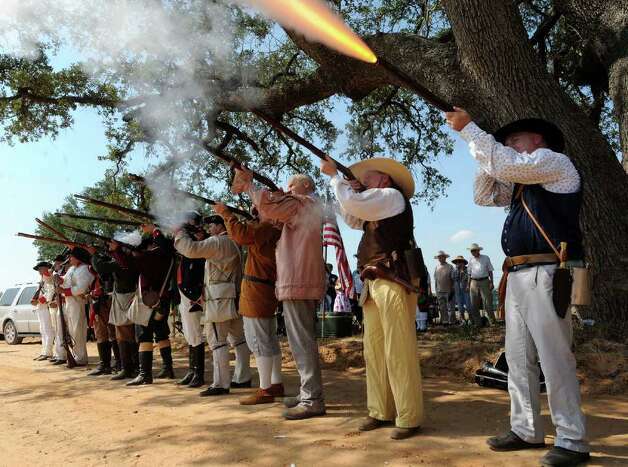 Royalist forces swept into San Antonio and took revenge on anyone they suspected of aiding the rebel forces. One of the royalist officers was a young Lt. Antonio Lopez de Santa Anna. The bodies of soldiers killed in battle were left where they fell. It would be nine years before their bones were gathered and buried in a communal grave. This story should translate well to the Texas-required 7th-grade history course. Here is a cause — the archaeological excavation and historical marking of the battlefield itself — which lends itself well to getting students to write letters to state legislators and state education authorities. Here is news of an archaeological site that could provide work for a generation of diggers, and experience for countless school kids taken on tour. And the story of the battle is one of those relatively unknown gems that excite students who realize, after they discover it, that they know something that most others do not know. As well, this should be supplement to world history courses, which in my experience too often overlook the independence wars and successes in Central and South America. The article mentions independence movements in Argentina and Venezuela. The United States fought Britain in the War of 1812, which was the western fallout of England’s simultaneous war with Napoleon (who was on the road to getting his comeuppance in Russia). Haiti’s drive for independence from France racked that Caribbean nation. A mapping exercise showing the various independence movements occurring between 1800 and 1826 provides links to parts of the narrative of American nations’ independence that often gets overlooked. The battle also ties together several otherwise loose threads in the Texas history curriculum. The Gutierrez-McGee Expedition falls into that time period and that type of movement to steal Texas known as the filibusters. The treachery of the Green Flag Rebels in executing the Spanish officers in San Antonio after the Spanish had surrendered raises issues of ethics in battle that are rich for discussion. Incompetence with which the Texian forces were led into the battle, missing completely the feint the Spanish troops made until they were already into a classic battle trap, is another place to emphasize the importance of having good leaders especially in rebellion (this will become clear to students, perhaps, when they study the events of 1775 and 1776 and Washington’s leadership, in the 8th grade curriculum in Texas). Santa Anna’s presence as a young officer at the Battle of Medina suggests that he got the idea of “no quarter” early in his career; see how the tactic plays out 23 years later at the Battle of the Alamo, the Battle of Coleto, Goliad, and the Battle of San Jacinto, with an older Santa Anna in command. 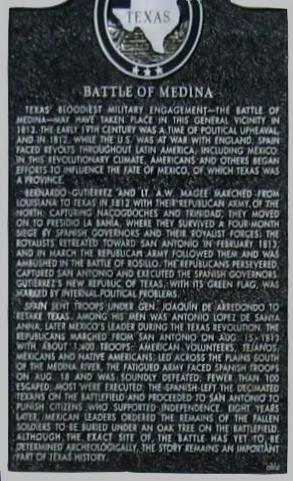 In the context of Texas’ becoming a “majority-minority” state with a very large population with historical ties to Mexico, the Battle of Medina deserves greater consideration in Texas history curricula. Partly due to the brutality of the Spanish victors to the survivors, wounded and dead, the battlefield itself was not cleaned up for years — bodies lay across a wide area. Medina was a touchy point, a point of embarrassment perhaps to local Mexicans and Texians, a loyalty test for the Spanish rulers. So the battle site was ignored and hushed up. 200 years later, we don’t know the exact site of the battle. A lot of work remains to be done, exploration of archives in Spain, Mexico and Texas, exploration of map collections, archaeological and paleontological work on the suspected sites of the battle. But every year this work remains undone, the story becomes that much more difficult to find. It is unlikely we’ll ever know all that we probably should about the Battle of Medina. “The Battle of Medina, the Final Battle of the First Republic of Texas,” by Thomas B. Green, a 2003 lone article on the 190th anniversary of the battle. Wikipedia’s entry (many teachers do not like citations to Wikipedia — be certain to track down sources listed here). For teachers and parents, Patrick M. Reynolds cartoons of Texas history were staples in the Dallas Morning News for years. His treatment of the Green Flag Republic, the Gutierrez-McGee Expedition, and the Battle of Medina are really among the best available for the junior high/middle school audience. You can buy the books directly from Reynolds’ Red Rose Studios; alas, I don’t have handy a key to which volumes of these graphic history books hold which stories. Reynolds has a compilation of all of the stories, however, in a slightly smaller format than the others, such as shown at Amazon.com. Do not confuse this Texas battle with the Battle of Medina Ridge, a February 27, 1991 battle between U.S. forces and Iraq in the first Persian Gulf War. Photo from the Pleasanton Express: “A Color Guard representing the U.S.A., Spain, Texas and Mexico, plus descendants of the men who fought and died in [The Battle of Medina] will be presented at the Battle of Medina ceremony. 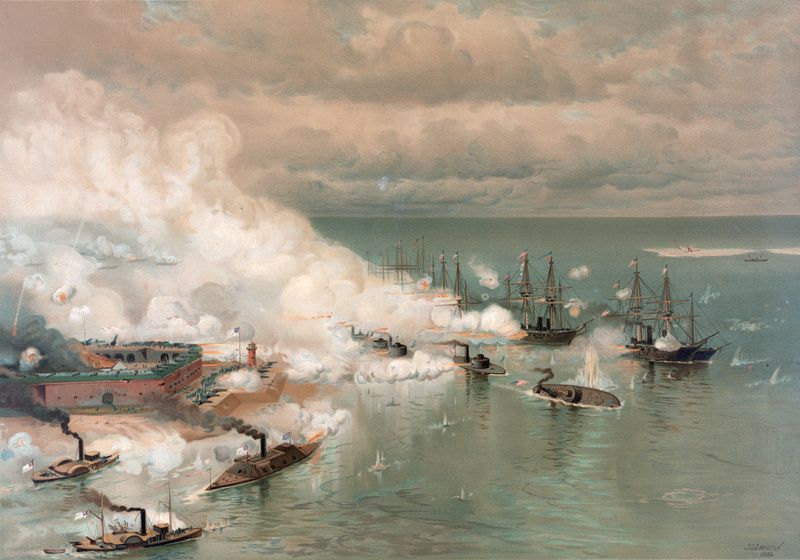 Julius O. Davidson’s painting (published by Louis Prang) of the Battle of Mobile Bay, August 5, 1864. It was 151 years ago today: Especially with the excellent help of Tom Petty, whose 1979 album “Damn the Torpedoes” propelled him to stardom, the phrase “Damn the torpedoes!” remains one of the most used phrases out of history. Just try to find someone who can tell you who first said it, and what the circumstances were. It’s a sign that history instruction is not what it should be on some matters. August 5 marks the 151st anniversary of the Battle of Mobile Bay in 1864, when the Union Navy under the command of Admiral David Farragut took Mobile from Confederate forces. Description: A combined Union force initiated operations to close Mobile Bay to blockade running. Some Union forces landed on Dauphin Island and laid siege to Fort Gaines. On August 5, Farragut’s Union fleet of eighteen ships entered Mobile Bay and received a devastating fire from Forts Gaines and Morgan and other points. After passing the forts, Farragut forced the Confederate naval forces, under Adm. Franklin Buchanan, to surrender, which effectively closed Mobile Bay. By August 23, Fort Morgan, the last big holdout, fell, shutting down the port. The city, however, remained uncaptured. Was Farragut lashed to the rigging? Wikipedia’s listing:An anecdote of the battle that has some dramatic interest has it that Farragut was lashed to the mast during the passage of Fort Morgan. The image it brings to mind is of absolute resolve: if his ship were to be sunk in the battle, he would go down with her. The truth is more prosaic; while he was indeed lashed to the rigging of the mainmast, it was a precautionary move rather than an act of defiance. It came about after the battle had opened and smoke from the guns had clouded the air. In order to get a better view of the action, Farragut climbed into Hartford‘s rigging, and soon was high enough that a fall would certainly incapacitate him and could have killed him. Seeing this, Captain Drayton sent a seaman aloft with a piece of line to secure the admiral. He demurred, saying, “Never mind, I am all right,” but the sailor obeyed his captain’s orders, tying one end of the line to a forward shroud, then around the admiral and to the after shroud.Later, when CSS Tennessee made her unsupported attack on the Federal fleet, Farragut climbed into the mizzen rigging. Still concerned for his safety, Captain Drayton had Flag-Lieutenant J. Crittenden Watson tie him to the rigging again. Thus, the admiral had been tied to the rigging twice in the course of the battle. 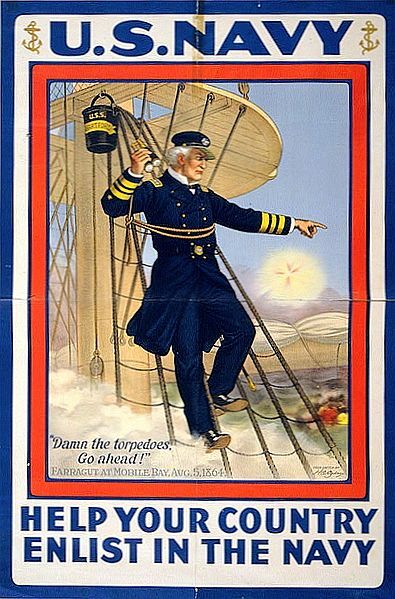 Did Farragut actually say, “Damn the torpedoes, full speed ahead? Mobile Bay had been mined by the Confederates, to hold off exactly the sort of Union attack Farragut mounted. Mines, in that time, were known as “torpedoes,” not the underwater-missiles made famous by World War II movies. Farragut had an iron-clad ship, Tecumseh, under his command leading the attack; legend holds that other ships slowed to allow Tecumseh to cross them and move ahead. Farragut asked why the attack was slowing, and upon hearing that they feared torpedoes (mines), he later was reputed to have said “Damn the torpedoes,” and urged moving at all speed. Did he say, “full speed ahead?” Accounts differ on that, even in legend. In one version he shouted to the ship Brooklyn, “Go ahead!” That’s unlikely in the din of sailing, coupled with the din of battle. Another account has him shouting (vainly) to the Hartford, “Four bells, Captain Drayton.” Yet another version, that almost makes sense, has him shouting to the Metacomet, which was lashed to the Hartford’s side, “Go ahead, Jouett, full speed.” The entire quote must be listed as attributed, and the only part most versions agree on is “Damn the torpedoes.” A World War I recruiting poster probably inscribed the quote into history (see the poster in this post). Alas, Tecumseh hit a torpedo early in the battle, and sank, killing most of its crew. 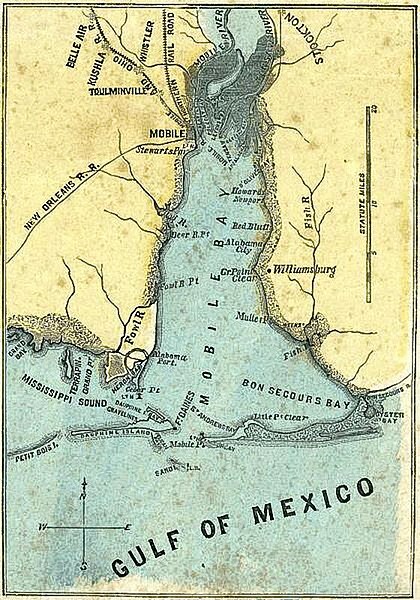 Political importance: Coupled with Gen. William Tecumseh Sherman‘s March Across Georgia, and the Fall of Atlanta, the Battle of Mobile Bay gave credence to the idea that the fortunes of the Civil War had turned in the Union’s favor. This victory probably contributed greatly to the re-election of President Abraham Lincoln against opponents who urged simply ending the war without victory. Mobile Bay was an important port? Mobile Bay stands as a monument to poor soil conservation practices, today. Maps of the battle show a much larger bay than exists today; since 1864, silting from the river has filled in the bay, making it much less useful, and much less important to shipping. 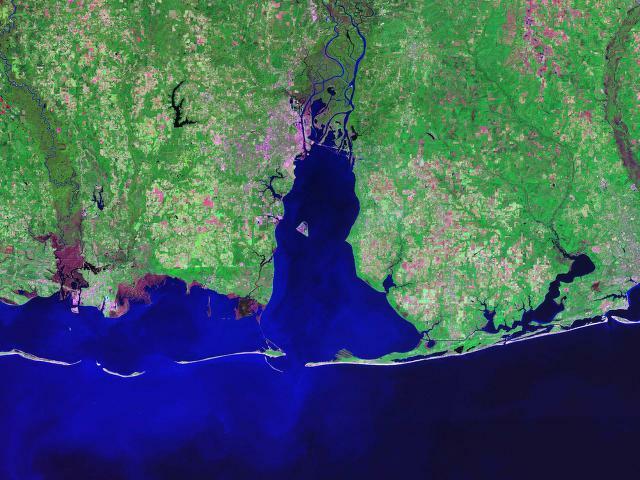 LandSat image of Mobile Bay, from NASA, 2003 (via Wikipedia). The Northern Bay is almost completely silted in by the Mobile River and others. 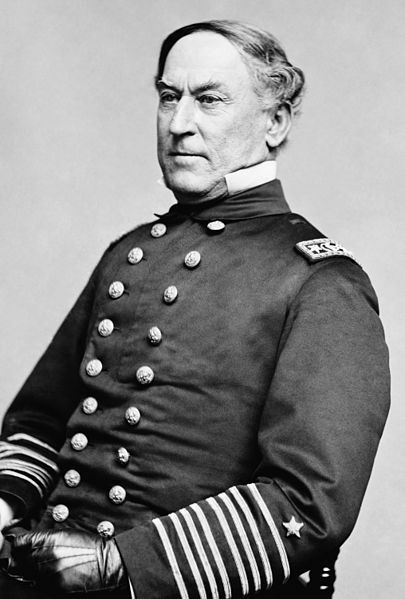 Whether Admiral David G. Farragut actually said, “Damn the torpedoes!” the phrase remains an often-used quotation to urge action in the face of uncertainty, hopefully, to victory. Farragut’s forces won the Battle of Mobile Bay on August 5, 1864, a key maritime battle of the Civil War. Whatever he said, it must have been inspiring. What torpedoes are you damning today? Navy History article on David Farragut, after whom five Navy ships have been named; Farragut Square in Washington, D.C., is named for the hero, and features his statue. Farragut was named Rear Admiral by President Lincoln, America’s first Admiral — the highest Navy rank had been Captain. Farragut’s statue was cast in bronze salvaged from the propeller of the Hartford, the ship he commanded at Mobile Bay. This is an annual event. Much of this is an encore post.